Today, I am excited to announce a GIVEAWAY for my readers! I am collaborating with a company called Dress and Dwell; it is a boutique and website that features clothing and home decor. Dress and Dwell and Lala Land have teamed up to pick one lucky follower to win this necklace I have pictured. Just through a few small steps listed below, you can be the new owner of this statement piece! Hi there! I’ve liked everything involving Facebook, am following you with WordPress and my email is katy.craze@yahoo.com Wish me luck because that necklace is so adorable! 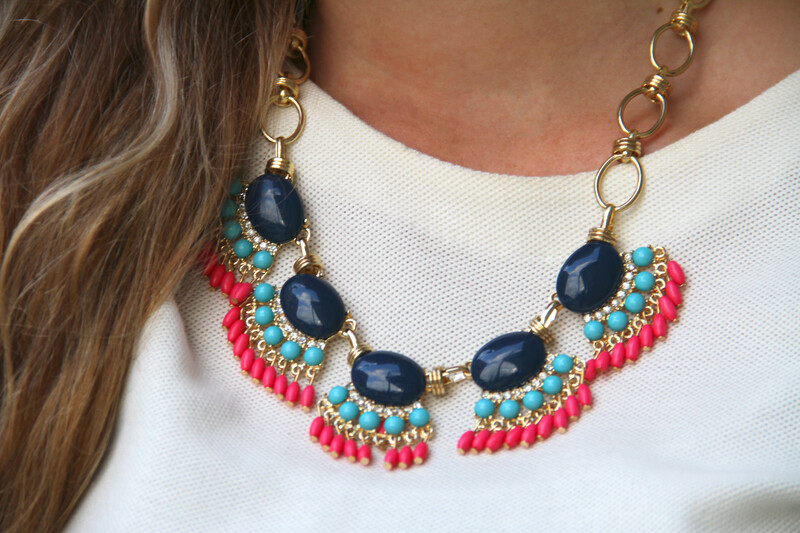 love this necklace and the colors!! thank you so much for the giveaway! that necklace is gorgeous! I like @Lala Land Fashion Blog on Facebook and follow your blog. I like Dress and Dwell on Facebook .I don’t have Instagram but liked their post about this great giveaway! I liked the picture posted on Lala Land Fashion Blog‘s Facebook page. I also follow on Twitter @tatzgrrly and tweeted.Thanks for the chance! Love that necklace! Started following you on Facebook, & Dress & Dwell on Instagram. Also liked the pic on Facebook. I liked @Lala Land Fashion Blog on facebook and followed the blog!